Address: Triana, 30, Vallehermosa (La Gomera), Islas Canarias. Set on the secluded Canary Island of La Gomera, this century-old house is built in stone from the island’s quarry and provides a charming setting for a peaceful, sunny getaway. 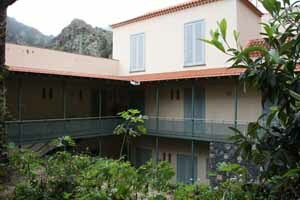 The rural hotel of Triana is set in the town of Vallehermoso, surrounded by inviting terraces and gardens. Here you can try a delicious sweet breakfast of typical local products whilst enjoying the year-round sunshine. Throughout the hotel you will notice attractive traditional features such as bare stone walls and dark wood parquet floors. The local town has several bars, restaurants and shops, providing convenient services for your stay. You can also spend a day walking amongst the stunning mountains and lakes of La Encantadora, 1 km away, or on the local beach, 3 km away. Please inform Hotel Triana in advance of your expected arrival time. You can use the Special Requests box when booking, or contact the property directly with the contact details provided in your confirmation. Guests are required to show a photo identification and credit card upon check-in. Please note that all Special Requests are subject to availability and additional charges may apply. The hotel does accept American Express as a method of payment. Guests who anticipate arriving at the hotel after 22.00 should contact the hotel directly prior to travel.